When building up the light and dark areas make sure your shape layers have a low opacity (around 15%). 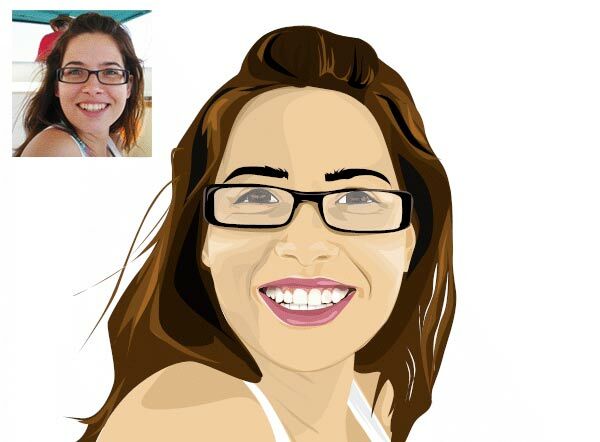 By layering up the shape layers, you are going to create a more complex looking vector. Look at the face and start picking out patches of colour/tone and create shape layers. Pointy, funky shapes are great..you don’t need to follow the image exactly. 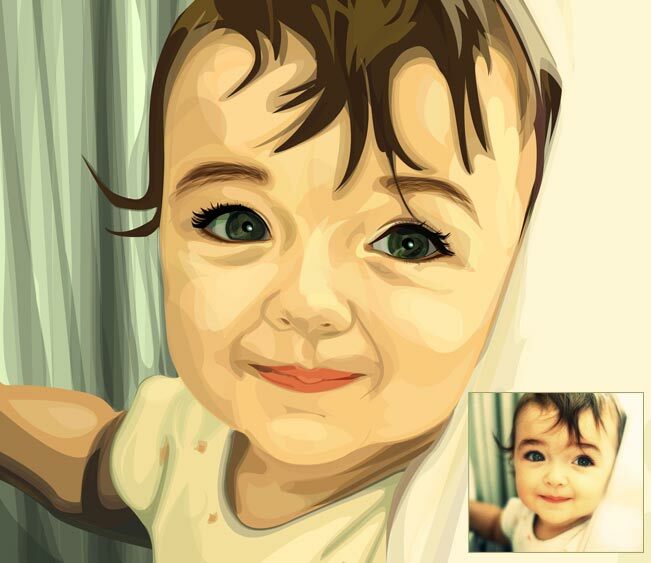 A little abstraction from the photo is what is going to create an outstanding vector. Look at the layers in the image below, you can see that many of them have a low opacity and interact together. 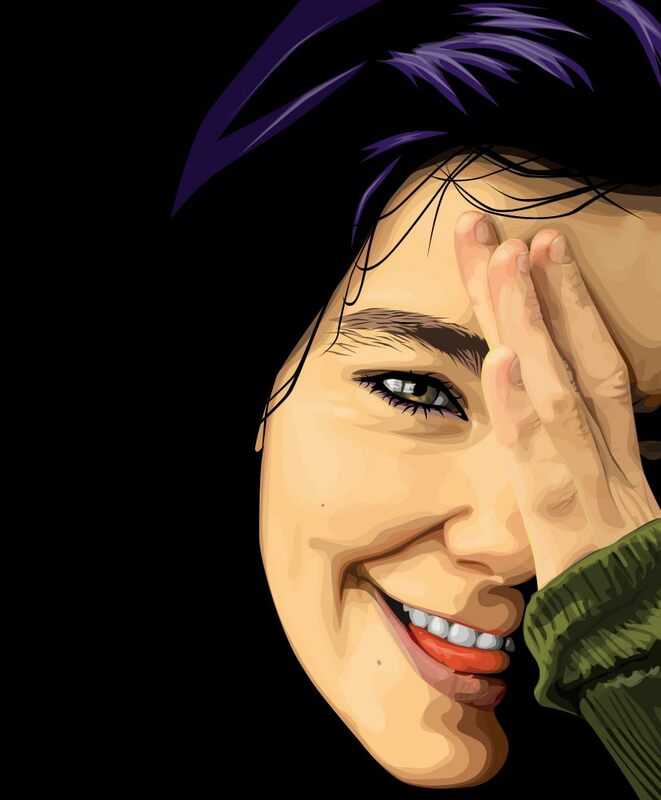 Don’t get put off if your picture looks a bit terrible to begin with…just keep adding layers! Just because you are colouring skin don’t think that your colour palette has to be all the same either. 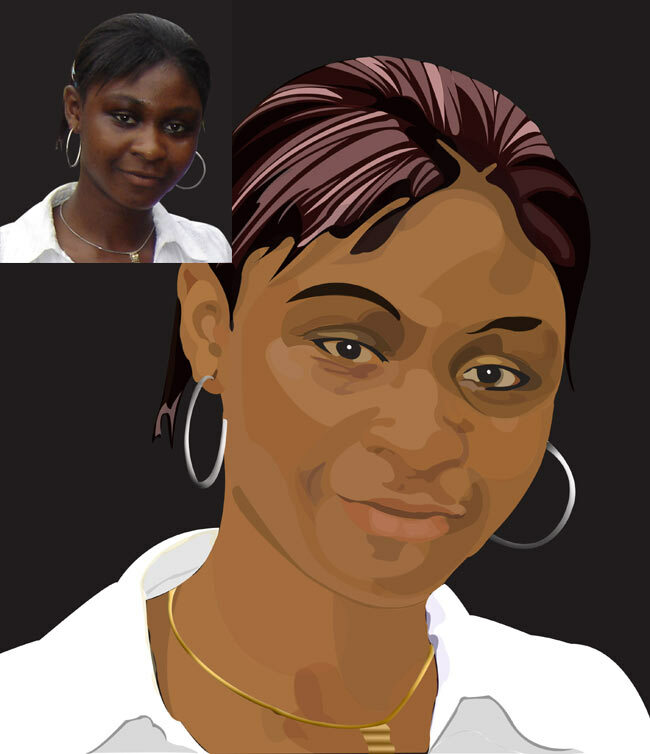 Infact, the use of various colours/tones is going to make your picture go from average to great. 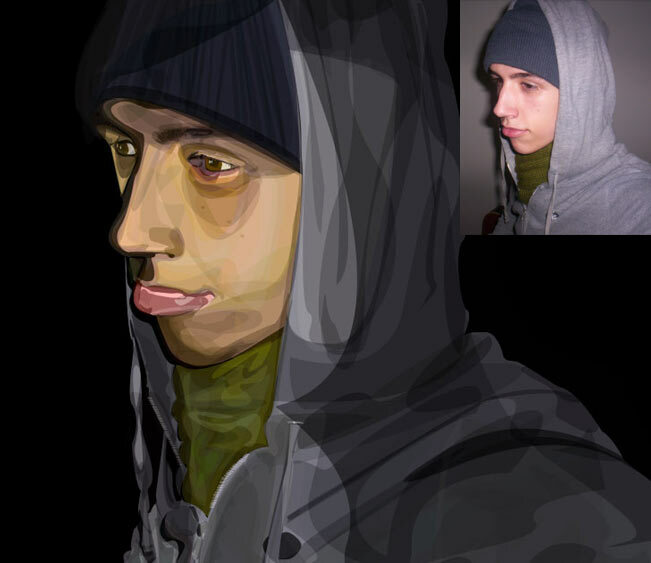 The above image shows some of the colours I used to form the skin, with varying opacity (not including lips etc). As you can see there’s a bit of variety and my final vector is quite tame. 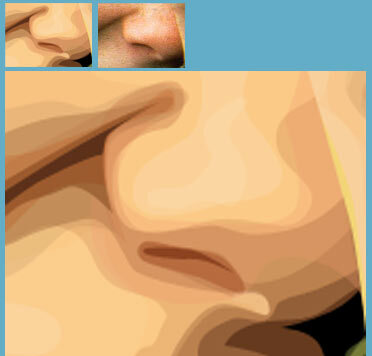 The image below shows the shape layers that form the nose. Below is the finished mouth. Just like the eyes, avoid using absolute white for the teeth. 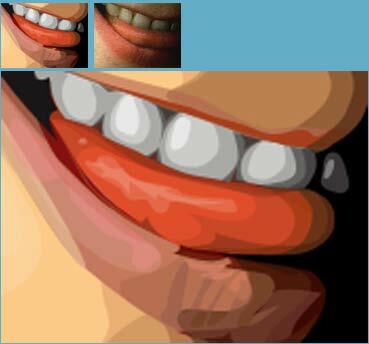 You can see how the lips are made up of overlapping layers, with their opacity altered. In some layers I have adjusted the Mode also, just for some variety. That’s about it. You just need to do this same procedure for the entire image. Zoom in to the photo and look for patterns/shapes and recreate them! Don’t merge or rasterize your shape layers. As long as all your layers are shape layers then you have a vector piece of art…That means you can scale the original psd up and down in Photoshop and it will remain perfect and unpixelated!! The final output will NOT BE a vector file (it will be a rasterized jpg etc), to output a vector file you need to use Adobe Illustrator. 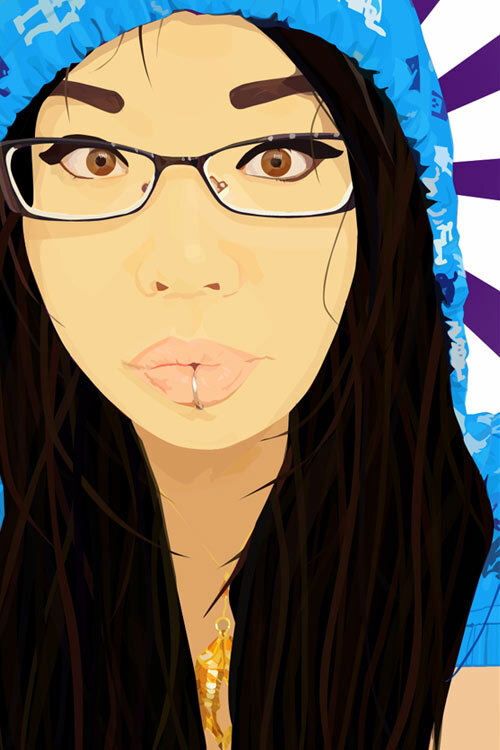 There is so much rubbish vector work on the net but rather than point out all the flaws of others work (and possibly recieve hate mail) I’m going to show you what I THINK makes great art. 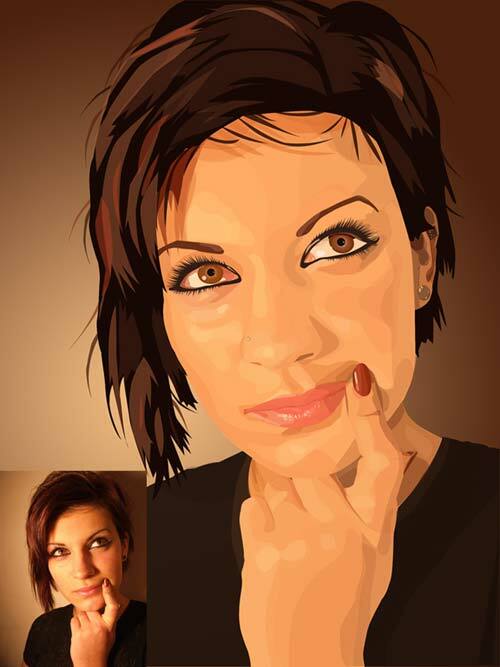 Hopefully by doing this, you will pick up a few tips for your next vector. 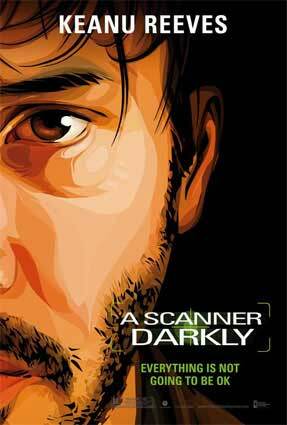 The Scanner Darkly poster, shown left, of Keanu Reeves is a prime example of great vector work. What makes it great? I can’t stand the boring result of just using Posterize and making shape layers exactly like that. It really doesn’t hold any artistic merit. Definitely create a posterized layer but only use it as a ROUGH guide for when you’re a little stuck. The funky shape layers of the face, on the poster shown left, are really great. Particularly around the eye area. You can see that the artist has abstracted the form of the shape layers but kept it so you can definitely see that it is Keanu Reeves. The shape layers also follow the form nicely of the underlying facial muscles. If you use the colour picker to select your vector colour palette, from the original photo, then the result will be bland and boring. Never ever ever just use the original photo colours. Strong colours work well for vectors, as you can see in The Scanner Darkly poster. 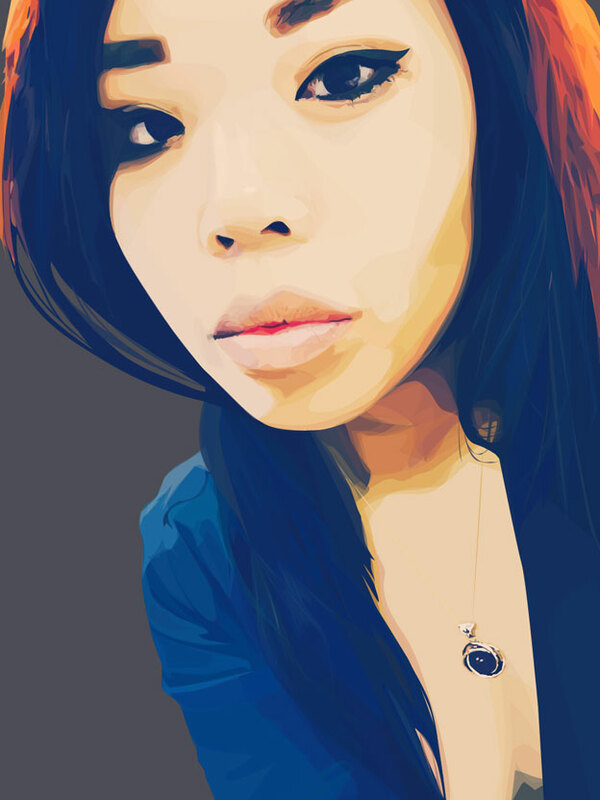 It’s great to try to get some really random colours or shades worked into your vector too. That way when you look at the zoomed in region of the vector it really does seem to be a bit of a mess BUT when you look at the whole image it looks great. 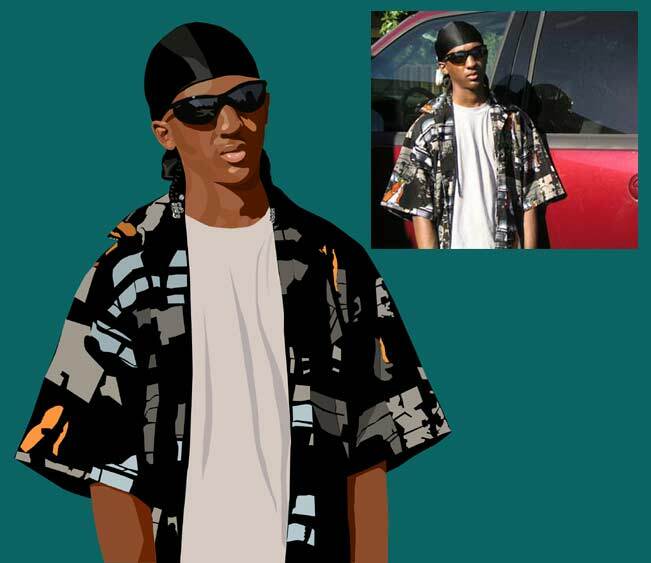 I don’t see the point of creating a super realistic vector that looks pretty much like the original photo. Again I think this is boring and dull. I don’t like to see 60 layers forming the gradient of a cheek. 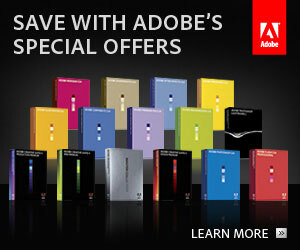 Rather, I prefer to see the vector image as having distinct layers. 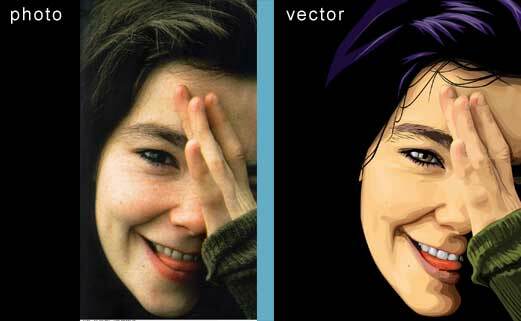 In summary any vector that looks really strange when you zoom in and makes sense when you zoom out is an OUTSTANDING vector! The only other advice I’d like to repeat is to take your time. I really hope that you enjoyed this tutorial and managed to learn a few helpful tips and tricks for creating your own vector art. Feel free to contact me via my contact page if you have any questions regarding this vector tutorial. Below is the Love Your Work section for this tutorial. 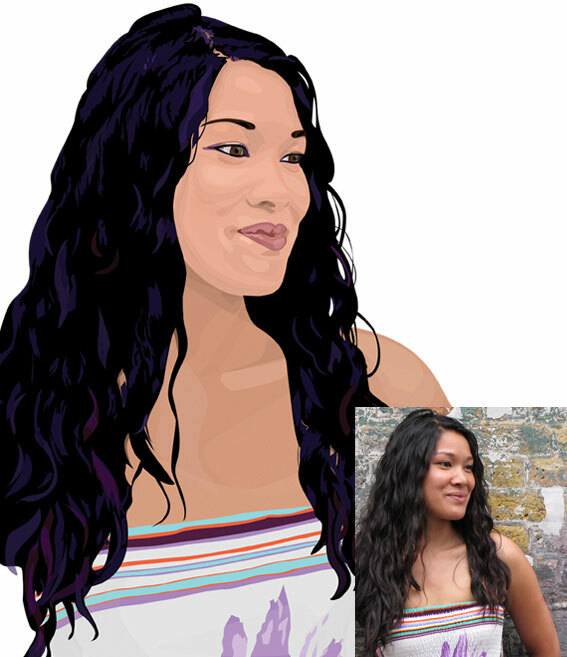 If you achieve a great vector art piece then definitely send me a copy in an email (save for web and send me a jpg or similar file, no PSDs please). 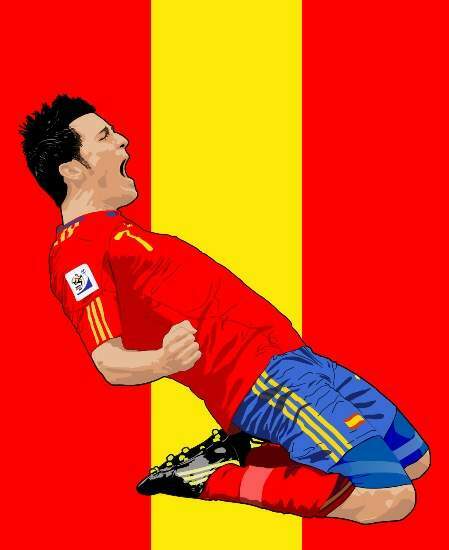 By having examples of your vectors on this site it will help inspire others with their vectors. Plus it will also act as a guide for those learning who are wondering how to do a certain area of their own vector.